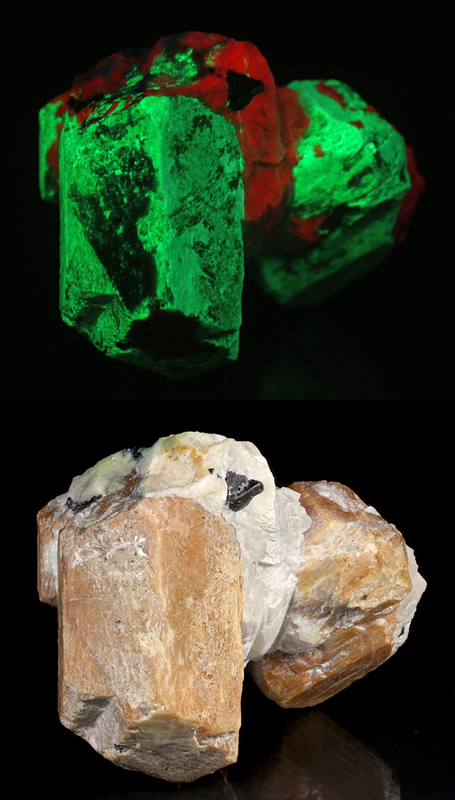 As a fluorescent specimen, this is a decent example of “lightning bolt” willemite in calcite. But the real interest of this specimen lies in the phlogopite, which is greatly enriched in Zn, Mn, and Ba. In fact, it isn’t really clear from the EDS scan (which see), if the mica is Mg or Zn (or perhaps even Mn) dominant, but most likely Mg > Zn > Mn > Ba, which would make it “phlogopite”. A reasonable description might be “intermediate barian phlogopite-hendricksite”. See the EDS scan for more discussion. 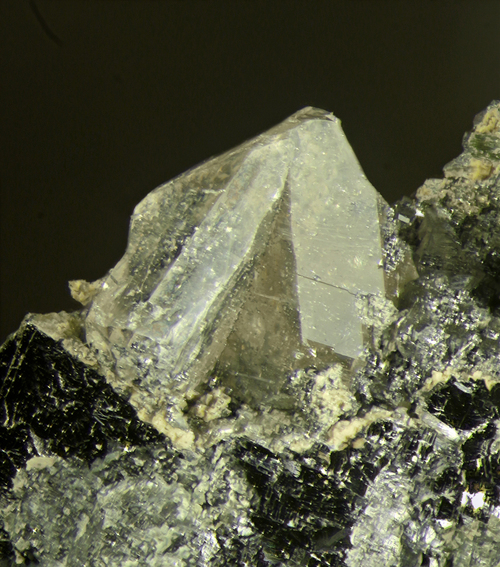 The “phlogopite” in the center is fairly euhedral. The large dark-brown area on the right is a rather thick stack of anhedral plates. 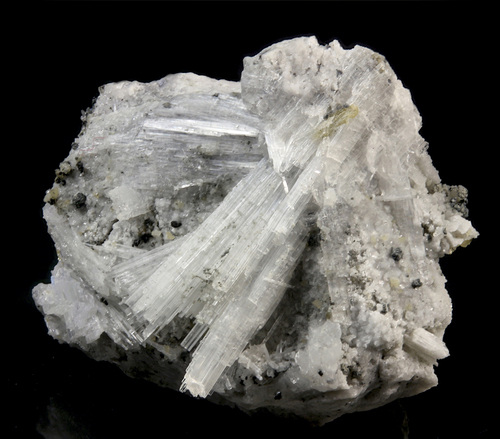 The crystals span ca 20 mm and are mostly well terminated on the "bottom". The dark gray stuff is donnayite-(Y). 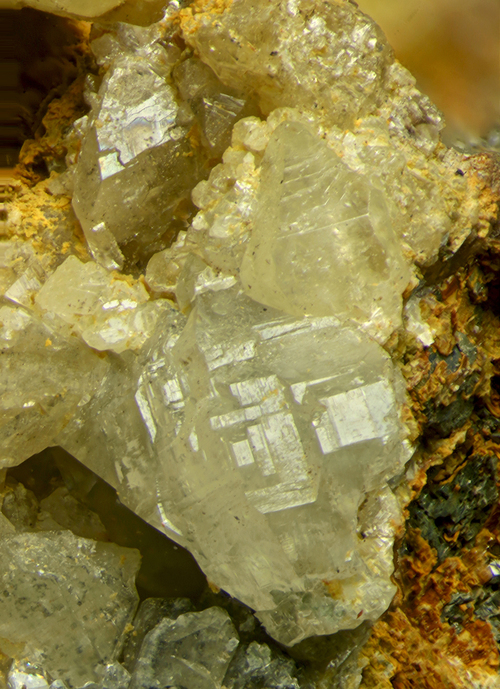 The donnayite crystals are well-formed, but very small and intergrown. In addition, some of the dawsonite is encrusted by tiny, water-clear, analcime crystals. Found on the Sterling Hill Mining Museu's Mine Run Dump ca 1994. 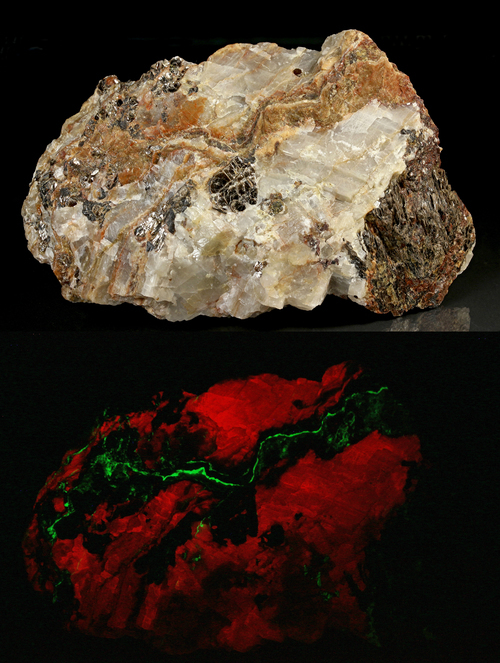 Flesh colored willemite fluorescing green and white calite flurescing orange-red. There is also minor black franklinite. As I recall, neither the large 3.5 cm crystal nor the 3 cm twin were damaged by this stupidity, but the twin wound up with almost no matrix. So the pieces have been glued back together. 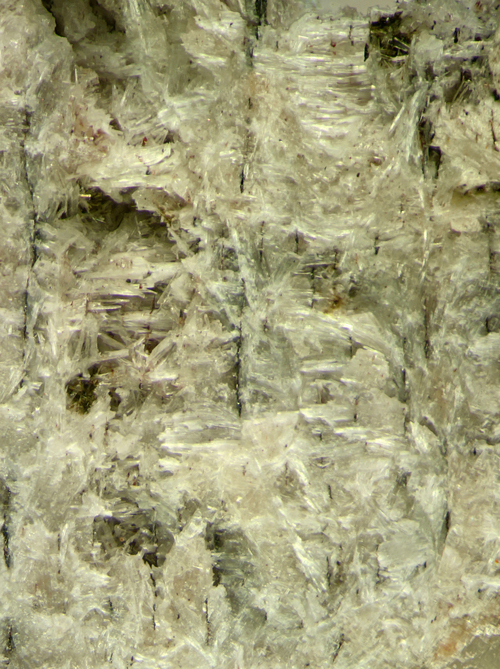 The "fault line", partly throght the calcite, but mostly along faces of the crystals, can be seen in some of the child photos. 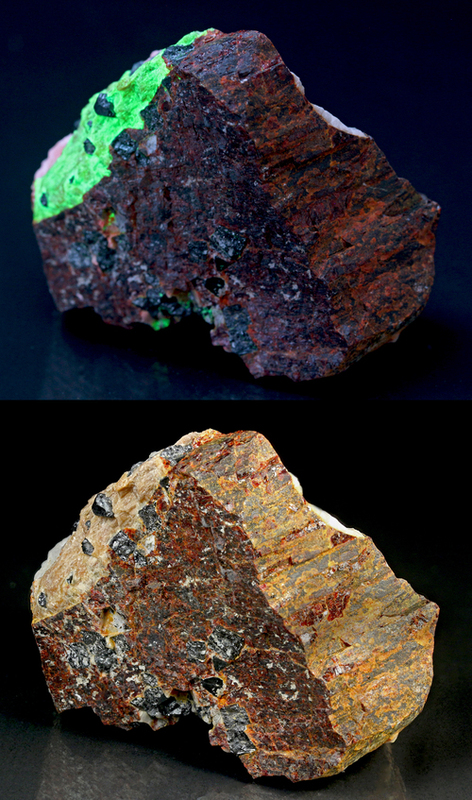 I have posted this as a sort of appendix to a series of earlier posts showing a series of “blobs”, some starting as tephroite and others as zincite, all which apparently end up –somehow – as fluoborite and “Mineral F of Dunn” with a variable suite of other minerals. This earlier series ends with [https://www.mindat.org/photo-446523.html], which is perhaps the one most similar to the current specimen. The other members of this series can be found by following the links provided in the caption for this photograph. The reason for posting yet another example of these “blobs” is that I now have two new EDS results (posted here as child photos). One of these is yet another confirmation that the needles are fluoborite. The other scan indicates that – surprisingly – the thin, black platy, material separating the layers of the “blob” is franklinite (with Mn) – not hetaerolite as might have been expected if this type of “layered blob” started out as zincite. This result makes the process by which these “blobs” formed even more geochemically mysterious. This (the parent photo) shows only fluoborite needles (to 1.1 mm), separated by the thin platy franklinite layers. 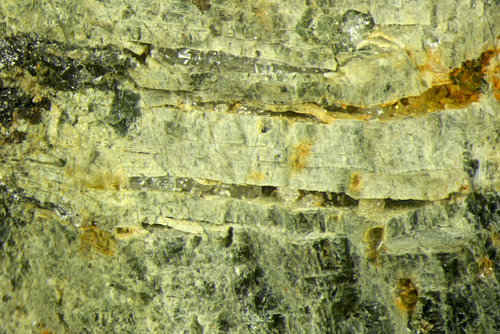 Note that the fluoborite needles grow preferentially more or less perpendicular to the franklinite layers. This is typical of the “layered blobs”, but not all of them follow this “rule”. Some of the child photos also show "Mineral F of Dunn". FOV 4.1 x 6.6 mm. 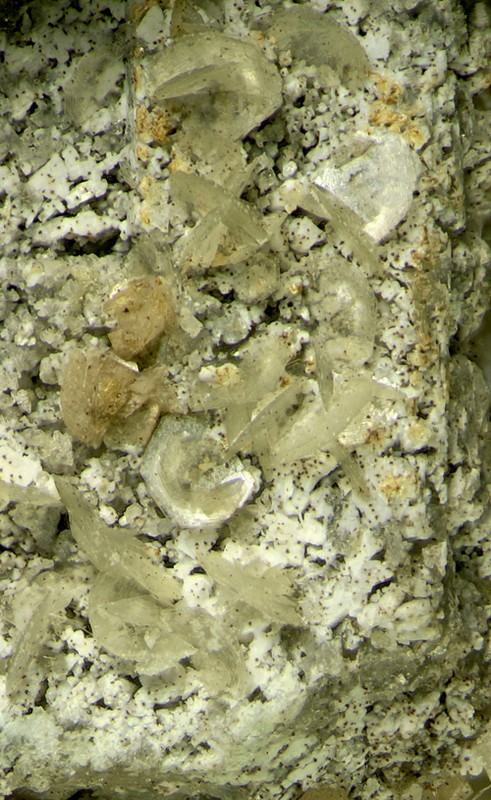 Thin platy discs of chabazite-Na on a PSM c omposed of bits of "feldspar" (?) cemented by a fizzy, non-REE, carbonate (probably calcite), possibly after shortite. Associated with Horváthite-(Y), Synchysite-(Ce) PSM Petersenite-(Ce) and siderite/rhodochrosite on microcline. Some of these minerals are shown in the related (same minID) photos. A vey peculiuar hedenbergite "layer cake" with cerussite "filling". See the EDS scan (child "photo"). This appears to be a cerussite twin, rather than just two cystals growing together. But I'm not sure. Not the greatest of photos, but sufficient to show the habit - especially in stereo. See the child photo. The black stuff is galena. It is actually silvery and highly reflective. But in trying to photograph it at the same time as the cerussite, it was all nothing: either black or a complete "blow out". Complex, transparent to translucent, cerussite crytsals with a greasy luster. This specimen is very rich in cerussite (for the locality). There are several similar aggegates. The matrix is largely altering galena. FOV 2.0 x 2.8 mm. 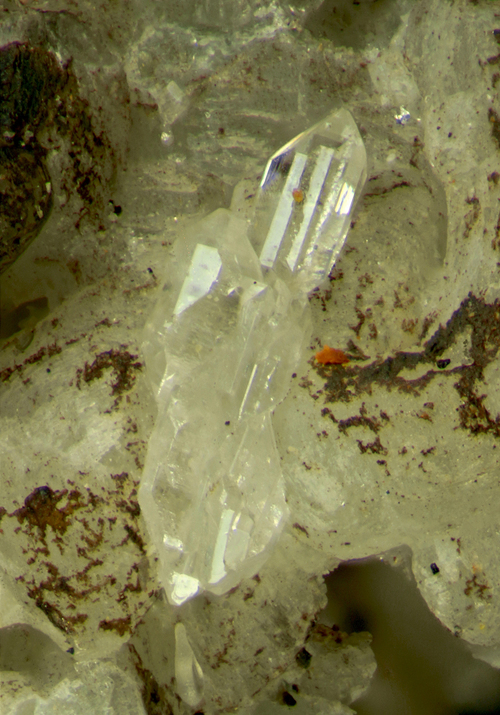 Agrregate of doubly terminated cerussite crystals in parallel growth spanning 1.9 mm. The UV photo was made in a half-darkened room - bright enough to capture some of the color of the zincite (albeit tinged blue by the UV source), yet dim enough for the willemite and calcite to "glow". The point being that the UV response of the willemite is so intense that you can almost see it under ambient lighting. T(he UV source was illuminating mostly one side of the specimen, so only the calcite on that side is "glowing"). I did not set out to make such a photo, but the result seemed interesting - to me at any rate. It isn't obvious from this photo that the zincite is very platy. I have posted a child photo to show this aspect.